The Bloody Massacre, often referred to as “The Boston Massacre,” is an engraving by Paul Revere that was hand colored by Christian Remick (1725-after 1783), who was a mariner and artist that hand colored several of Revere’s prints. 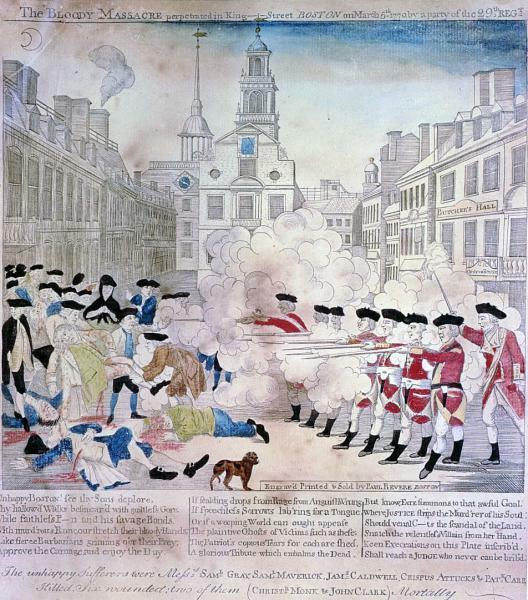 (2) This print is misleading because it inaccurately depicts British soldiers firing on their commander’s orders at a group of people in Boston. It also does not show Crispus Attucks, a mulatto, who was the first to die during the fight. (3) Despite its inaccuracies, it is Revere’s most well known print, and the most referenced print of the event. However, it is not the first print of the event. Allegedly, Revere copied his print from another by Peter Pelham. The two prints are nearly identical. (2) Brigham, Clarence S. Paul Revere’s Engravings (New York: Atheneum, 1969), 61-63.